When I was first learning to can back in the 1970’s salsa was not on my radar at all. That might be because the canning books I followed didn’t have any recipes for it. Fast forward to the 21st century and there are lots of salsa recipes in the canning books. Salsa is a form of relish and is as easy to make as pickles. It does require some chopping, which I do with a knife; although some people prefer to use a food processor. I can salsa for use later and include vinegar, as you would for other relishes. 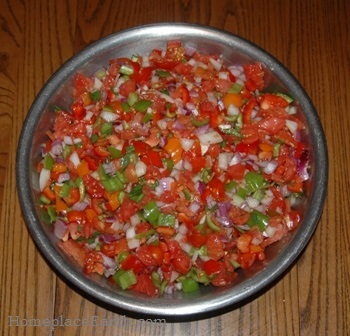 Recipes for salsa to consume fresh might not include vinegar. The recipe I use is for Zesty Salsa that I found in the Ball Blue Book from 1998. You can find the same recipe here. 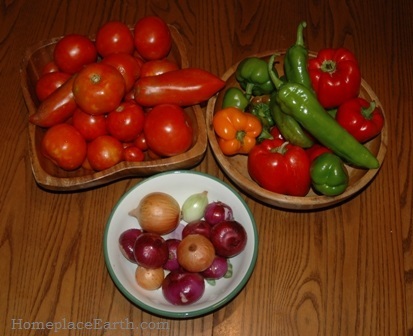 The main ingredients are tomatoes, peppers, and onions which I have in my garden. The vegetables you see in the first photo are the ones shown chopped in the second photo—all of which made the 6 pints of salsa in the last photo. Besides tomatoes, peppers, and onions, the recipe calls for cider vinegar, garlic, cilantro, salt, and hot pepper sauce (optional). I always have garlic available from my garden. Instead of cilantro, which I don’t grow, I used celery leaves and parsley from my garden. One of the reasons I like making salsa is that it is so colorful when you have everything chopped up together. Although the recipe includes both green sweet peppers and hot peppers, I am not into hot so I used sweet peppers only and no hot sauce, although I have added some mildly hot peppers in the past. You have to be careful with canning recipes. You can sometimes make substitutions, but you need to do them wisely. The salsa was canned in a hot water bath which is used for high acid foods, so care must be taken to maintain the acidity. Tomatoes are high acid foods, but onions and peppers are not. Vinegar in the recipe contributes to the acidity. You can substitute different kinds of peppers, such as sweet for hot, but be careful to not have more than the total amount of peppers called for in the recipe. The same goes for onions. They could be any combination of red, yellow, or white, but the total should not exceed the amount in the recipe. 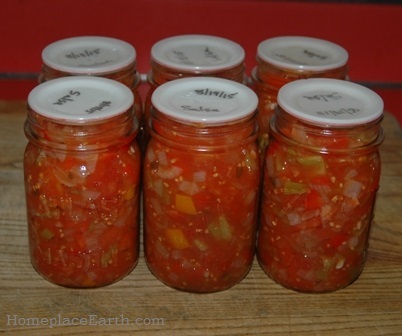 The Complete Guide to Home Canning has great information about this and other substitutions. You can find it online at the National Center for Home Food Preservation website as a free download or order your own hardcopy at Purdue Extension’s Education Store. Besides tacos, salsa can be used as an addition to many foods, including potatoes and eggs. Of course, it can be eaten as a dip just as it is. I grow cowpeas out to dried beans, store them in jars in the pantry, then cook them as needed. We have found that salsa goes great with those cooked cowpeas. If you are growing your own staple crops, salsa and other relishes can add interest and taste to your meals. Last winter friends gave us two jars of relish. One was corn relish, but I don’t remember the name of the other. It was all delicious on cowpeas. If you are putting up pints for your table, make sure to can some half-pints (jelly jar size) to give as gifts. The time, energy, and produce that went into making the salsa now will be appreciated by the recipients when gift-giving time rolls around. It will also make your life easier to have something on hand to share with your friends anytime the mood strikes. If you are wondering about those white lids on my canning jars—they are reusable lids. I like to use them on high acid foods and only on jars that I won’t be giving away. I’ll have to make another batch with regular lids for gift jars. Salsa, canned in jars, is a convenience food for me. I have not tried fermenting it, but according to Sandor Katz in The Art of Fermentation, you could do that. Reduce or eliminate the vinegar and use plenty of salt. Tomatoes, peppers, onions, and garlic are available at the farmers markets now. If you haven’t grown your own, you could still do this. The 10 Day Local Food Challenge is coming up in October. If you plan on taking part, having a supply of salsa put up will enhance your meals. The 10 Day Local Food Challenge allows ten exotics in your diet, which are items not local. For me, that would be the salt and vinegar in the recipe. I haven’t made vinegar, but I suppose you could make your own from local apples. Then vinegar would be off the exotic list. Maybe you could find a vinegar maker and saltworks within your local food shed. It is something to think about. Almost everyone grows tomatoes and eventually has enough to preserve for later. I’m interested in using the least energy to get my food to the table and have been using my solar dryers as much as possible. Sometimes with tomatoes, however, I have too many for the dryers, the weather is threatening rain, or I just need to get these tomatoes through my kitchen in a hurry. When the kids were growing up, I used to can a lot of spaghetti sauce. I would add garlic, onions, basil, parsley or celery, and peppers, all from the garden, and cook that sauce down for a couple hours before canning it. I did that on the days with the most tomatoes. On the days with a lesser harvest, I would can tomato juice or tomato soup. The juice would be used as a base for soup. I could use a quart of juice and throw in all sorts of vegetables and leftover meat. Of course, you could also just drink the juice. Now that I’m drying tomatoes, I use the dried ones for spaghetti sauce and have become spoiled. I no longer have a kettle of tomatoes boiling away in my kitchen on hot summer days. By choice, we don’t have air conditioning in our house and are very aware of anything emitting heat. But still, there are those days when I have to resort to canning tomatoes. When you look up tomatoes in the canning books, they tell you the first step is to dip them in boiling water for 30-60 seconds, then in cold water to remove the skins. I have never thought that was a good idea. Talk about heating up the kitchen! You would only want to do that if, for some reason, you needed to have whole tomatoes in your jars. If you are making sauce there is no need to keep them whole. I acquired a Foley Food Mill early on in my canning days to make applesauce with and it works perfect for putting the tomatoes through to remove the skins and seeds. The tomatoes need to be quartered and cooked till soft to go through the Foley mill. You put them in the top, stir it around and the juice comes out the bottom. You need to dump the skins and seeds in a container and fill the hopper again. It is a handy tool to have in your kitchen. Mine hangs from the rack with my pots and pans. 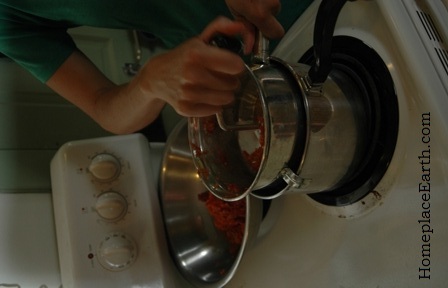 In the photo, it is being used on a pan on the stove. That burner is not on, it is just more convenient to use it there because the pot with the tomatoes was still hot. I use tomato juice to make the tomato soup I can, a favorite for lunch, especially when a friend or one of our grown children stops by. It is all ready to heat and eat. Once the juice is made there is minimal preparation to make the soup, which is then put in the jars and run through the canner. In the first photo you can see jars of tomato juice and soup on my basement shelves. My recipe is based on one that came from our county cannery back in the mid-1980’s. I’ve posted it on my recipe page here. The Foley mill works great, but you have to cook the tomatoes first. That’s hot work, but not as hot as dipping them in boiling water to remove the skins. In 1986 I bought a Victorio Strainer. I see they are still available today, as are any parts you might need. You only need to quarter the tomatoes and put them through raw. I’ve been using it with the small Principe Borghese tomatoes I have and I just wash them and put them through, no cutting needed. With the Victorio strainer the skins and seeds separate out to a container as you continue to put the tomatoes in. No need to dump anything out in the process, as with the Foley mill. 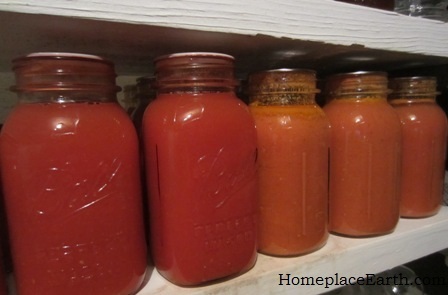 The tomatoes are never heated until the juice is heated to put into the jars or made into soup. 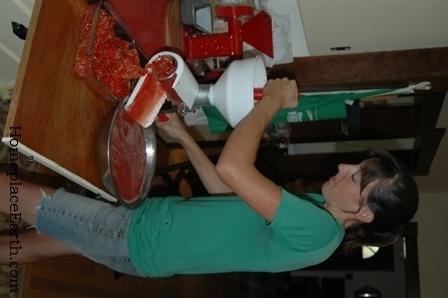 That’s our daughter Betsy working on her tomatoes with the Victorio. But what if you’ve canned enough soup and juice for the year and you still have more tomatoes than you know what to do with? You can put up more juice to be made into spaghetti sauce later. This is where your other dried veggies can be useful. Use your limited solar dryer space to dry okra, zucchini, peppers, onions, parsley, celery, and anything else you might want to put in spaghetti sauce. I didn’t mention garlic because I just store that as it is for the year and have cloves whenever I need them. I didn’t mention basil either. It is a staple in spaghetti sauce, but it doesn’t go through the dryer. I hang it in my kitchen until dry, then store the basil leaves in jars. When you want a thick spaghetti sauce, combine the juice with the dried veggies and herbs, give it all a whirl in the blender and cook it for a short time-maybe simmer for five minutes or so. If you have time, let it set a little longer to let the flavors blend. Your sauce can be ready by the time your pasta is cooked and the table is set. This is an opportunity to get really creative. You can add different things for different dishes. The okra or zucchini is the secret to getting thick sauce in a hurry. If you don’t add okra or zucchini, you will have to do more cooking, however, cooking down a quart of sauce takes much less time than cooking down a couple gallons of sauce. If you have enough dried tomatoes, you could add some of those, also. Okay, maybe you think all that might be a good idea, but you still just want to can spaghetti sauce. You could juice the tomatoes and put them in the fridge overnight. The solids will separate out from the “tomato water”. You can preserve the “tomato water” to add to soups throughout the year. Use what is left to cook down in a shorter time for sauce. 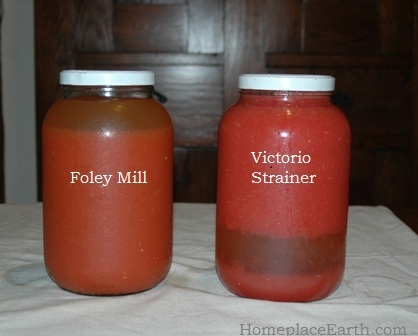 The photo shows two gallon jars with juice from the Foley Food Mill and the Victorio Strainer after they’ve spent the night in the refrigerator. For some reason, the juice settles out with the “water “on top with one method and on the bottom with the other. That relatively clear liquid is what is being boiled away when you cook your sauce down. Tomatoes can be canned in either a water bath canner or a pressure canner. Since I have a pressure canner, I use that, but when I started canning, all I had was the water bath. Make sure you follow all the safety guidelines whenever you can anything. The National Center for Home Food Preservation is a great resource and has the book Complete Guide to Home Canning available as a free download. The print edition can be ordered. The book So Easy to Preserve is available for order from the same website at http://www.homefoodpreservation.com/. That book includes freezing and drying. I hope I have given you some helpful ideas. Have fun and stay cool!